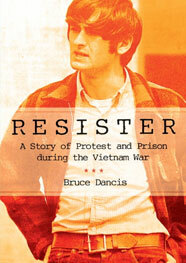 Resister, Bruce Dancis’s absorbing portrayal of the tumultuous sixties from his vantage point as leader of Cornell’s Student for a Democratic Society, describes what it was like to challenge the world’s most powerful nation in the midst of a war that saw millions of Asians and 58,000 U.S. troops die, a failed war for which no-one at the highest level of our government has ever been held accountable. Dancis and anti-war opponents like him were widely praised but also damned. Inspired by hatred for the war, the draft, black liberation and sexual freedom, the emergence of the New Left and Catholic Left and the possibilities it presented seemed a golden opportunity to seriously change the country’s direction. Many of their opponents believed the SDS and similar rebel groups symbolized the decline of order, stability, tolerance and civil patriotism, a frontal assault on values where people knew their place and politics stopped at the water’s edge. By August 1968 Cornell had become a center of college antiwar activities. Its SDS chapter was the largest in the country, Many of its members were veterans of the “We Won’t Go” movement and the Bobby Kennedy and Eugene McCarthy presidential campaigns. On campus Dancis befriended economic professor Douglas Dowd and Re. Dan Berrigan and other sympathetic staff members. Eager to become nationally involved, he left school for a year and when he returned he learned of new student demands by women and African Americans insisting on full equality. In his epilogue Dancis asks “how successful was the movement?” Echoing Tom Wells’ conclusion in The War Within, he agrees that it played a “major role in restricting, de-escalating and ending the war.” Well, maybe. But as the losing war dragged on and more and more military coffins were shipped home to grieving families, influential and powerful centrist forces began turning against the war. But he’s right in including the dramatic role played by the Vietnam Veterans Against the War, whose members marched down Washington’s Pennsylvania Avenue and then threw away their medals, shocking some but energizing millions of others. And, of course, there was the young John Kerry, famously testifying before the Senate Foreign relations Committee in 1971, asking, “How do you ask a man to be the last man to die for a mistake? What draft-age resisters did best was to clog the draft boards and courts and in many other ways confront the government’s war machinery. They helped create the most important anti-war force in American history. They helped end the hated draft, whose existence whetted the appetite of our home front warriors. They were young and courageous, and took serious risks. Bruce Dancis’s gripping Resister does them justice.